Approximately 600 volunteers gathered data from the shores of Oahu, Kauai, and Hawaii Island during today’s annual Hawaiian Islands Humpback Whale National Marine Sanctuary Ocean Count. 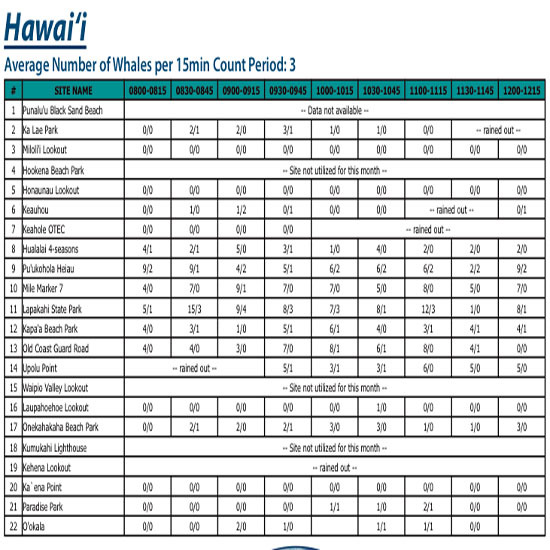 The count is a yearly shore-based census that provides snapshot data on humpback whales. Participants tally humpback whale sightings and document the animals’ surface behavior during the survey. Volunteers collected data from 60 sites statewide. A total of 194 whales were seen during the 8:30 a.m. to 8:45 a.m. time period, the most of any time period throughout today’s count (58 sites reported data). The day began with excellent viewing conditions at most locations, but rain eventually cancelled quite a few sites. The National Marine Sanctuary Foundation supports this project. Please show your support by purchasing a 2013 Sanctuary Ocean Count T-shirt or making a donation that benefits the Hawaiian Islands Humpback Whale National Marine Sanctuary.